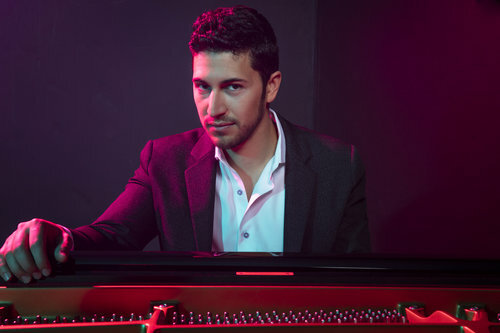 Multifaceted American jazz pianist and composer Emmet Cohen has emerged as one of his generation's pivotal figures in music and the related arts. A recognized prodigy, Cohen began Suzuki method piano instruction at age three, and his playing quickly became a mature melding of musicality, technique, and concept. Downbeat observed that his "nimble touch, measured stride and warm harmonic vocabulary indicate he's above any convoluted technical showmanship." In the same spirit, Cohen himself has noted that playing jazz is "about communicating the deepest level of humanity and individuality; it's essentially about connections," both among musicians and with audiences. Possessing a fluid technique, an innovative tonal palette, and an expansive repertoire, Cohen plays with the command of a seasoned veteran and the passion of an artist fully devoted to his medium. Emmet Cohen is committed to the intergenerational transfer of artistic knowledge, history, and traditions. His signature professional undertaking is the "Masters Legacy Series," a celebratory set of recordings and interviews honoring legendary jazz musicians. He serves as both producer and pianist for each album in the series. The goal of this landmark, ongoing project is to provide musicians of multiple generations a forum to transfer the unwritten folklore that is America's unique musical idiom. Cohen has observed that playing true jazz "is enriched immeasurably by connecting and studying with jazz masters, forging backward to the very creation of the art form." Volume one of the "Masters Legacy Series" features drummer Jimmy Cobb, and volume two spotlights bassist Ron Carter. In addition, Emmet Cohen has established a more comprehensive role in the world of the creative arts that extends beyond performing. Cohen visits 50 schools yearly through Jazz at Lincoln Center's "Jazz for Young People" program and regularly presents jazz history and performance lectures. Himself an alumnus of the YoungArts Foundation, he now produces and directs multidisciplinary YoungArts programs nationally that include creative writing, theater, dance, visual arts, cinematography, music, voice, and jazz. Through designing student curricula and selecting master artists as teachers and mentors, Cohen connects effectively with performers and audiences. Cohen has also been involved with interdisciplinary programs directed by choreographers Debbie Allen and Bill T. Jones. Emmet Cohen's exacting piano artistry has been recognized in many significant forums. He placed first in both the American Jazz Pianists competition (2014) and the Phillips Piano Competition at the University of West Florida (2011). He was a finalist in the prestigious American Pianists Association's Cole Porter Fellowship (2015, 2011) and the Thelonious Monk International Piano Competition (2011). Cohen has appeared in world-renowned jazz events, including, the Monterey, Newport, North Sea, Bern, and Edinburgh jazz festivals and the New Orleans Jazz and Heritage Festival. He has also performed at the Blue Note, Dizzy's Club Coca-Cola, Birdland, London's Ronnie Scott's, Jazzhaus Montmartre in Copenhagen, Lincoln Center's Rose Hall, and the Kennedy Center, and was received in the Oval Office by President Obama. He is currently Hammond B3 organist-in-residence at Harlem's SMOKE jazz club. Cohen is leader of the "Emmet Cohen Trio" and is a member of Christian McBride's trio, "Tip City," the "Herlin Riley Quartet," and the "Ali Jackson Trio." He also serves as pianist and music director for jazz vocalist and television personality Lea DeLaria. Cohen has appeared regularly with Kurt Elling, Billy Hart, Jimmy Heath, and Brian Lynch, among other luminaries. His recordings include the "Masters Legacy Series featuring Jimmy Cobb" (2017); "New Directions" (2016) with Herlin Riley; "Questioned Answer" (2014), co-produced with Brian Lynch; "Infinity" (2013), featuring his Italian Trio; and his acclaimed debut CD "In the Element" (2011), with bassist Joe Sanders and drummer Rodney Green. Cohen holds a Masters Degree from the Manhattan School of Music and a Bachelors Degree from the University of Miami's Frost School of Music, where he studied with esteemed pianist and educator Shelly Berg. In his formative years he was tutored in classical piano at the Manhattan School of Music's Pre-College Division. A powerful and charismatic performer, Emmet Cohen possesses wide-ranging talents that are reinvigorating the contemporary arts world both domestically and internationally and are received enthusiastically worldwide.